The High Priestess is concerned with all ideas, big and small. She likes to look at things from every side, and reflects the multitude of feelings and attitudes around her. She is balanced, the still point between the pillars of mercy and cruelty. Without judgment she watches and hears it all. Her emotions don’t swamp her intellect, and her intellect doesn’t dull her feelings. At her best, the High Priestess manages both with grace and level-headedness. 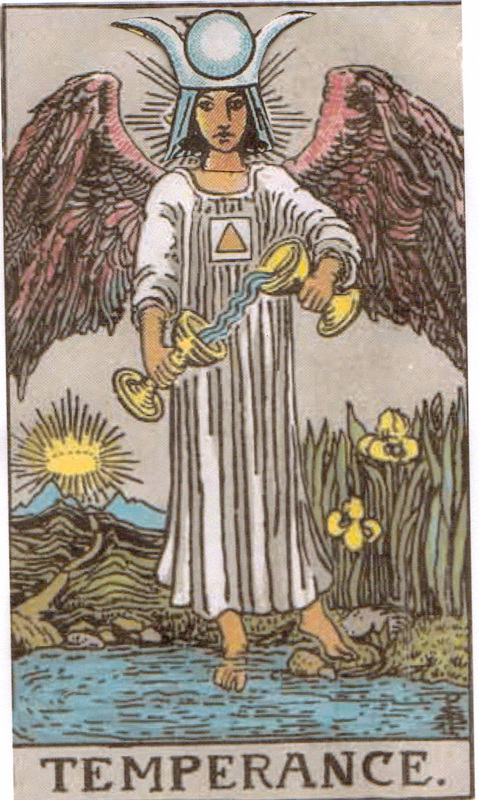 Temperance is also about balance, following the mean, being temperate. 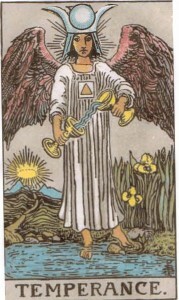 As the angel stands on both earth and water, Temperance represents the ability to bridge the divide between one’s emotions and practical life. And it’s also concerned with the big ideas. Angels are the intermediary between the planes, bringing mortals messages from on high. They provide us our ‘eureka’ moments. The Temperance angel is engaged in pouring water, while wearing the sign of fire on his chest. He is perfect harmony. The High Priestess is comfortable in this position. She’s at home with the middle way. Though not so accustomed to the sun, the balance between fire and water works in this case. Neither swamps, or burns out the other.